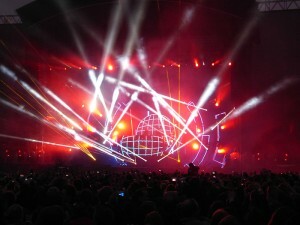 The first live show in Europe to use Robe’s brand new Pointe moving light fixtures was headlined by legendary DJ and house music producer David Guetta at the DR2 Plaza Festival in Hannover. The Pointes, supplied by satis&fy AG, were part of the specification provided for his headline slot enjoyed by 17,000 fans who packed the venue. Guetta’s lighting designer is Leggy (Jonathan Armstrong), and lighting is looked after on the road by lighting director Junior (Alex Cerio) from Smash Productions. Junior is a big Robe fan and has used various Robe products in his work for some time. He was delighted to get the chance to run 20 ROBIN Pointes – making their worldwide concert debut - in Hannover. These were supplied, together with the rest of the lighting rig, including another 74 Robe fixtures by the leading German lighting rental house which has over 800 Robe units in its hire stock. For the Hannover gig, Junior used 12 of the Pointes - among other lights - positioned on six moving ‘fan’ trusses above the stage for blasting at the areas down below and out and around into the audience. The other eight were on stands directly on Guetta’s riser, two each rigged at 90 degrees upstage right and left and four under-hung from the riser. 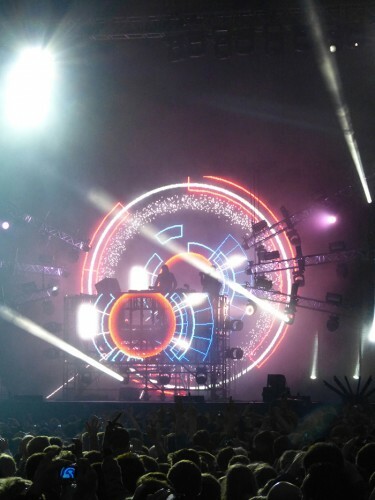 The idea was to give the impression of Guetta floating in air, and together with Robe ColorWash 2500E ATs upstage behind the riser, this enabled them to achieve this effect. Junior loved the Pointes, which he used to produce stunning aerial looks and eye-popping beam effects. "I liked everything about them," he enthuses. "They can be really nicely contained, precisely focused and well balanced, and I had lots of fun using the rotating proms macros with index chasing, etc." He also appreciated the two gobo wheels (one static and one rotating), the power and punch of the super-sharp parallel beam, adding that the zoom "is excellent" and he achieved far more looks out of them than he would from a standard beam fixture. "I really get the Pointe," he concluded. In addition to the 20 Pointes, the Hannover rig contained 20 Robe ColorSpot 2500E ATs, 30 ColorWash 2500E ATs, 18 LEDWash 600s and four Robe ColorSpot 700E ATs, plus strobes and 8-lites and 2-lites, all driven by Junior using a grandMA2 light console. satis&fy‘s Crew Chief for the event, Andre Nordhoff also gives The Pointe the thumbs up. "They are lightweight with a strong, punchy beam and a moonflower effect normally seen on Xenon fixtures," he says. "It is a highly effective beam, spot, wash and effects light in one compact housing, with excellent brightness and fast movement." Being a true multi-purpose fixture, it has great appeal for rental companies, coupled with the low power consumption and long lasting lightsource. Guetta’s standard touring equipment specification is devised by production manager Alan Green to be as generic and flexible as possible as it has to deal with all possible scenarios with equipment when sourced locally worldwide. (The only element toured is the completely bespoke Pilot Visual video control software). Leggy has evolved the look and feel of the show in close collaboration with Ben Brett from Pilot Visuals who has created the stunning optical oeuvre that defines the look of the stage and has helped rocket Guetta’s live performances into a class of their own. The production elements put Guetta right at the centre of the action. David Guetta’s FOH sound is mixed by Hassane Es Siahi, Louis Walters is the video content creator and operator and production manager Alan Green is at the hub of the global production operation.